During the 25th anniversary of the Worldwide Developers Conference (#WWDC) hosted by Apple in San Francisco this morning, huge strides were made to the company’s operating systems with the introduction of OS X Yosemite and iOS 8. One of the biggest takeaways of this morning’s announcement? 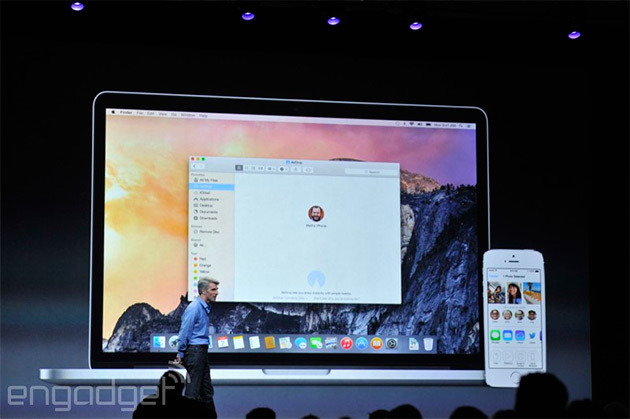 The overarching integration between Apple’s iOS 8 for mobile devices and OS X Yosemite for desktop computers. That means your phone and laptop have never been so in sync. How close? Read below to see our favorite highlights. Now shared between your iPhone and MacBook. Receive a phone call on your laptop when your phone is out of reach, and receive text messages – yes, not only iMessages! – on your laptop, too. Your iPhone also just got a lot smarter, with a new QuickType feature that should more accurately guess what you’re trying to type in the context of a message. “Software head Craig Federighi said onstage that Messages is the most used app on iOS,” making it a huge focus for Apple who gets to battle with other top messaging app contenders, according to CNET. From laptop to home, privacy beyond. Apple took a huge step forward with HomeKit, the home automation system that can “work with locks, lights, cameras, thermostats, or other objects” with smarter help from Siri, says USA Today. Even more to beef up your mobile privacy, the Touch ID sensor on iPhone 5s now works on third-party apps. … And that’s just to start. Both iOS 8 and OS X Yosemite will be available this Fall to the public for free. Keep your eyes peeled HERE to stay up-to-date on the latest industry news from Speck!